Set in a semi-basement with rough cut stone walls, this establishment occupies what was once an 8th century medieval bathhouse. And, like the cafes in the Jewish quarters of cities like Girona and Barcelona, the owners have given the place a warm and cosmopolitan atmosphere that makes it very attractive. 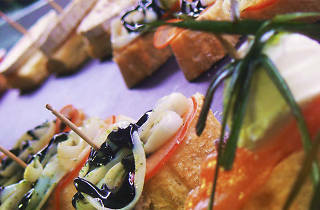 In the evening, Basque-like pintxo tapas appear on the bar and people start to stop by for a glass of wine or beer. 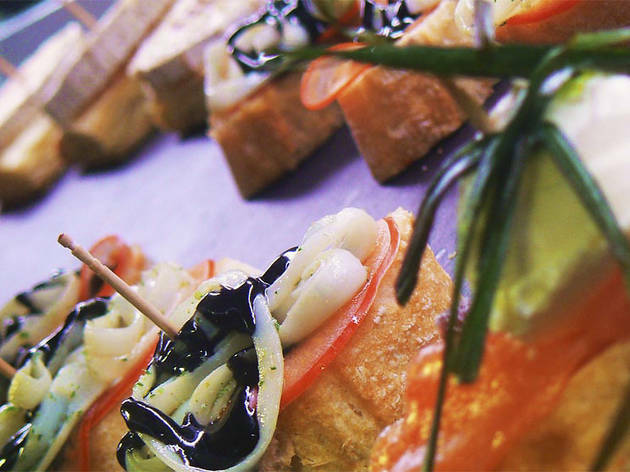 Some have enough with the tapas while others go for a full-blown dinner. The most popular pintxo here is the potato omelette one but the boards of Iberian cold cuts, prawns in garlic sauce and fried eggs with potatoes and ham or sobrassada are also very recommendable.